Beautiful Chinese Rowan, strong growing but still taking a long time to reach its ultimate height. Delicate grey-green pinnate foliage. 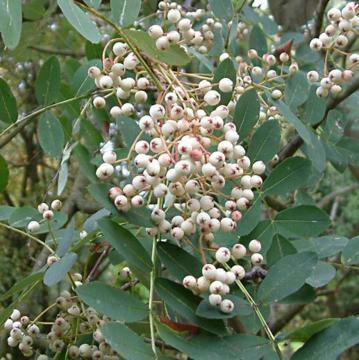 White flowers in spring and numerous small white berries, with a slight pink flush, in autumn. Leaves turn red later in autumn. The berries usually remain hanging on the branches well into winter, long after the leaves have dropped. Best in moderately fertile, moist, well drained soil, preferably neutral to acid, but quite tolerant of most reasonable conditions. Moderately drought tolerant, less so if grafted. Sun or light dappled shade.